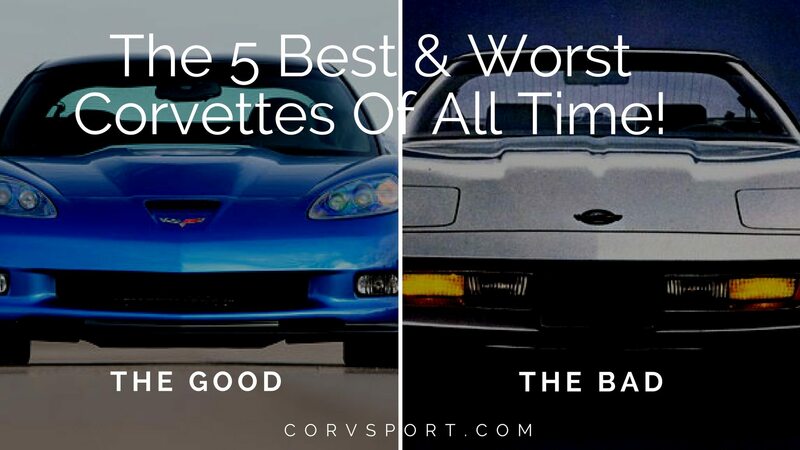 The 5 Best & Worst Corvettes Of All Time! What makes some Corvettes better than others? Still, just as “beauty is in the eye of the beholder,” so too is each individual’s perception of what makes one Corvette stand out as being “the best” or “the worst” of its kind. As an aficionado of all-things Corvette, it took me considerable time to assemble a “best of/worst of” list that I felt would do justice to my beloved sports car. After all, every Corvette on the road – from a commonplace fourth-generation coupe to an early model-year C1 – is something special to behold. No matter how fast or slow, how generic or utterly unique, a Corvette stands out in a crowd. So exactly how does one select the best and worst Corvettes of all time? If the list was based solely on horsepower, the contenders for best and worst would be pretty easy to decide upon. At the same time, this selection process would discredit many fine candidates that, for reasons varying from stricter EPA requirements to safety restrictions, would never make the mark simply because they didn’t have as much power at the pedal. Build quality might be a reasonable means of selecting winners and losers, but as technology has evolved, so too (for the most part anyway) has the quality of the cars being manufactured. Aesthetics? Paint color? Optional Equipment? The Exhaust Note? YES to all of these – except that, as I’ve said before, if you asked a dozen people, you’d get a dozen different answers. Ultimately, in selecting the best of/worst of list that you’re about to read, I began by polling the internet, taking lots of notes, and then really considering each of the Corvettes I’ve had the great privilege and pleasure of driving over the years. Beyond that, I went back into the years of research I’ve amassed while working on Corvsport.com (It’s amazing the amount of insight you gain about any topic when you spend the better part of a decade studying it on a daily basis.) And, finally, in addition to all the research and opinion polls, I also selected these cars based on how each generation – each model – has captured my imagination and fueled my own desires of owning a Corvette. When Harley Earl introduced his Corvette to the world in 1953, Chevrolet felt certain that their two-door roadster would be a surefire hit. Afterfall, American Servicemen still stationed in Europe after World War II were exposed to many of the two-seat sports cars that were taking that continent by storm. Cars built by Mercedes, Jaguar and MG had captured the attention of these soldiers, and many returned home in search of something similar that they could have for their own. When the first Corvette rolled off the assembly line on June 30, 1953 – Americans did respond, and a love affair (of sorts) began with the Corvette. 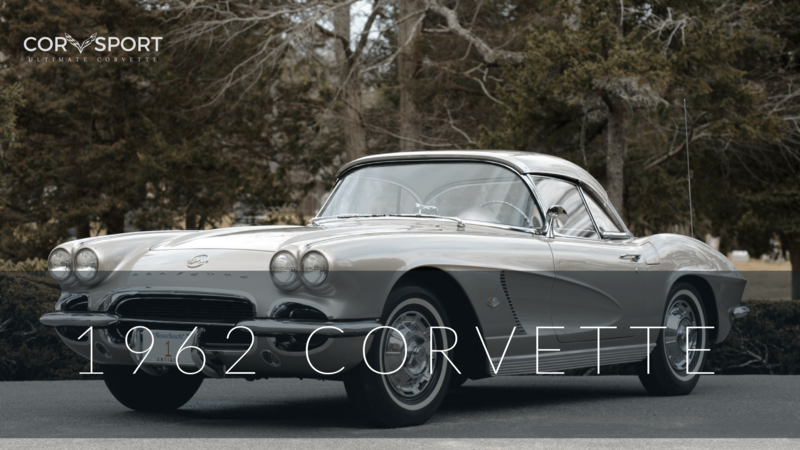 Despite its initial warm reception however, the Corvette was quickly plagued with a number of real problems that adversely influenced the car’s initial popularity. The 1954 Corvette, which was largely a carryover from the 1953 model year, came at a high sticker-price for its day. Priced at $3,254.10, the Corvette was considered far too expensive for the youthful market for which the car was intended. The car was under-powered – with a stovebolt six-cylinder engine which produced a mere 155 horsepower. Moreover, General Motors early marketing campaigns did nothing to instill confidence in potential buyers. Chevrolet advertised the base price of the 1954 Corvette at $2774.00 (which was still more than the price of a Cadillac with a standard V-8 engine), and indicated that the car, when equipped with “optional” equipment, drove the price up over the three-thousand dollar price range. However, the “optional” equipment in question included the two-speed Powerglide transmission, windshield wipers and a heater! Consumers saw through this marketing trickery and sales of the 1954 Corvette suffered dramatically because of it. Despite a reputation of being a highly reliable automobile, only 3,640 units were manufactured – less than a third of Chevrolet’s projected total. Of the 3,640 that were built, nearly 1,500 units remained unsold in dealerships across the country at the end of the model year! There tends to be a trend between the introduction of a new-generation of Corvette, and the general overall quality of the new model. 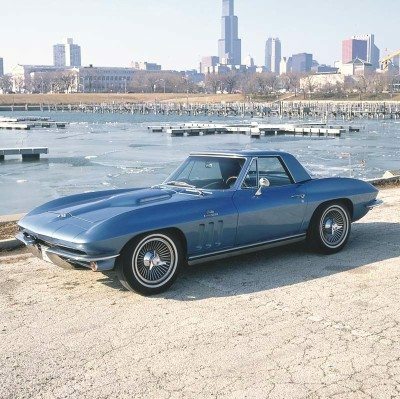 There are exceptions of course – the 1963 Split-Window Stingray (which is included in the “best of” portion of this list) is arguably the most desirable of that generation and one of the most collectible of any Corvette ever built. The same could not be said of the fourth-generation Corvette when it was first introduced in 1984. The 1984 Corvette was not considered a failure by any means. In fact, few cars in history have ever been more eagerly anticipated than the arrival of the C4 Corvette. This new ‘Vette was a completely original design – from top to bottom – and was a contemporary interpretation of the American Classic. Sales in 1984 also reflected the American public’s excitement at the prospect of owning a fourth-generation Corvette. Chevrolet sold 51,547 units that year, which is the second highest number of units sold (the most was 53,807 units sold in 1979) in Corvettes sixty-plus year history. So why would such a highly-anticipated and well received car make any “worst of” list? For starters, the car received almost immediate criticism for being far too “harsh-riding” during daily driving. While the car was setup to corner and handle on road courses, the ultra-stiff suspension jostled the car’s occupants so dramatically that it was considered by some to be “undrivable” on the open road. The interior received significant criticism as well. The 1984 Corvette had a passenger side dashboard bumper (part of a passive restraint system) that jutted out in front of its occupant. It contained deep door sills (as a result of the unit body frame) that resulted in drivers and passengers having excessive difficulty climbing into and out of the car. The digital dashboard was difficult to read, especially when exposed to direct sunlight. And, between excessive exhaust and road noise, the car was just plain loud. Mechanically, the car contained the unreliable and difficult to maintain “Crossfire Injection” fuel delivery system. While the engine produced sufficient power (though limited to just 205 horsepower,) the fuel delivery system required frequent maintenance to continue running. The 1984 Corvette also came equipped with the 4+3 Overdrive Manual Transmission. This transmission was clunky, featuring a high-effort clutch and shift linkage that made stop-and-go driving challenging. The 4+3 Overdrive Manual Transmission was deemed so unreliable, that most Corvettes sold between 1984 and 1988 came equipped with an automatic transmission, at which point GM decided to do away with the transmission all together. Lastly, the aesthetics of the 1984 Corvette were criticized as being “remarkably restrained” and lacking any real body-lines. To this day, many Corvette enthusiasts denounce the fourth-generation Corvette as being one of the least-inspired of any of the Corvettes produced both before and since. The silver-lining of the 1984 Corvette is this – anyone looking to purchase an affordable used Corvette can readily find the early fourth-generation model, especially the 1984 vintage, for sale in any market. They are also considered to be the most affordable of all Corvettes on the used-car market today. The last three entries in this “worst of” category all come from the era of the C3, or third-generation, Corvette. That’s not to say that the C3 was a sub-standard entry in the history of the Corvette. In fact, some of the early examples of the third-gen Corvette were the most well regarded, most-powerful and, arguably, the most iconic of any Corvette ever built. However, the third-gen Corvette remains one of the longest production runs of all time (a variant of the C3 was built from 1968 to 1982 – a total of 15 years!) and, along the way, there were bound to be some less-than-desirable attributes associated with at least some of the different model years of this car. Towards the end of the C3’s long and challenging existence, it was clear to all involved that the Corvette engineers and design teams were focused on its next-generation model, leaving the current model to continue on essentially unchanged from the previous model years. This was especially true of the 1979 Corvette. From the outside, the 1979 Corvette was virtually identical to the 1979 edition, minus some of the cool special edition models that were available in the previous model year. In 1978, Chevrolet introduced the incredibly popular black-and-silver Indy 500 Pace Car and Silver Anniversary editions. While neither of these special edition cars offered much of anything other than a unique paint scheme (as well as a front/rear spoiler and decal kit in the case of the Indy Pace Car), both of these cars still had some flare to them. For 1979, no special edition models were offered, and few features were introduced to entice prospective buyers to consider purchasing a Corvette. 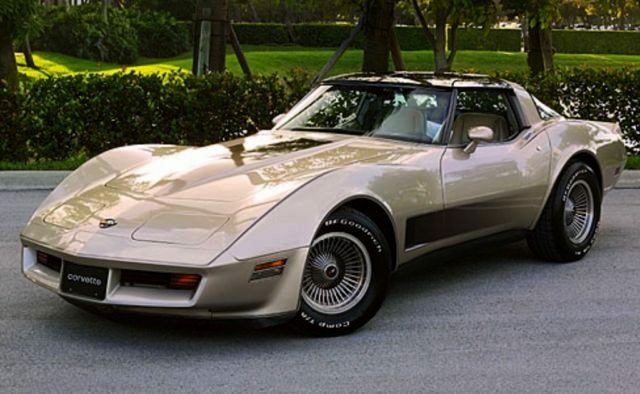 Mechanically, the 1979 Corvette was a far cry from its older, more powerful predecessors. Whereas a 1969 Corvette was boasting as much as 435 horsepower (when equipped with a 427CI engine), the 1979 Corvette offered just two engine options – the L48 engine which boasted a meager 195 horsepower, or the L82, which was only marginally more impressive at 225 horsepower – and both of these power plants only achieved that level of power thanks to the introduction of an “open flow” muffler design. Standard features for the 1979 Corvette were equally unimpressive. The ignition cylinder lock received extra shielding to reinforce it, the previously optional AM/FM radio became standard equipment, and an illuminated visor-mirror combination for the passenger sun-visor became one of the few available options for the 1979 model year. The most notable change to the car was the introduction of the high-back seats that had previously been introduced in the 1978 Pace Car the year before. 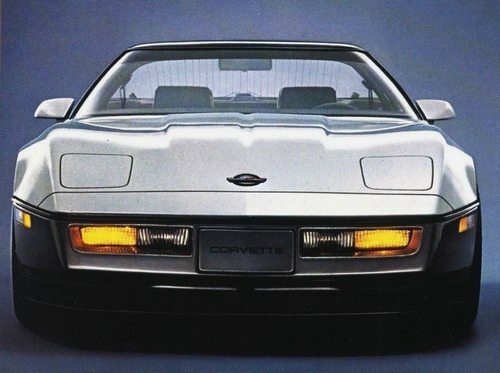 While most automotive critics were quick to criticize the C3 as being overpriced and no longer relevant (when compared to more competitively priced rivals like the Mazda RX-7, the Datsun 280ZX and even the 1979 Porsche 924), the 1979 Corvette’s greatest accomplishment was that it sold more units in one year than any Corvette before or since. With a base price of $10,220.23, the 1979 Corvette sold a total of 53,807 units, a record that appears to have no threat of being broken by any other model year of Corvette. The 1982 Corvette – Collector’s Edition! By the time the 1982 Corvette arrived on the scene, there was no question that the car’s only real value was to serve as a marketplace holder until Chevrolet finally unveiled its next-generation Corvette. By their own admission, Chevrolet executives made the decision to manufacture the 1982 Corvette solely to allow the new manufacturing plant in Bowling Green, which had opened in the summer of 1981, to have time to test out new manufacturing machinery and develop standardized assembly procedures while working on an already familiar design. More than that, the 1982 Corvette was a bit of a “Frankenstein’s Monster.” It still featured a chassis that was introduced in 1963, a body design that was introduced in 1968, and for 1982, the new “Cross-Fire” fuel injection system that utilized injectors mounted into twin throttle-body assemblies. The 350 cubic-inch, L83 engine produced an unimpressive 200 horsepower. Worse still, the 1982 Corvette was only manufactured with an automatic transmission, marking the first time since 1955 that a manual transmission wasn’t offered. To “celebrate” the departure of the third-generation Corvette, Chevrolet offered a final, commemorative “Collectors Edition” model. For its time, the 1982 Collector Edition Corvettes were considered one of the best C3 models of them all. David McLellan, then Chief Engineer of Corvette, stated that it was “a unique combination of color, equipment and innovation (resulting in) one of the most comprehensive packages ever offered to the Corvette buyer.” While it featured a few unique features – including an all-new frameless lifting rear-glass hatchback, a special crossed-flag emblem on the hood that read “Corvette Collector Edition,” finned “turbine” alloy wheels (reminiscent of those first introduced on the 1963 split-window Stingray), a special silver-beige metallic paint scheme and bronze-tinted glass T-tops – the car was still little more than its other base model counterparts. Perhaps the most astounding part of the 1982 Corvette was its price. Whereas the 1979 Corvette sold for just over ten-thousand dollars, the 1982 Corvette nearly doubled in price, with a base coupe starting at $18,290.07 and the Collector Edition Corvette demanding a staggering $22,537.59, which was also the first Corvette to break the $20,000 price barrier. 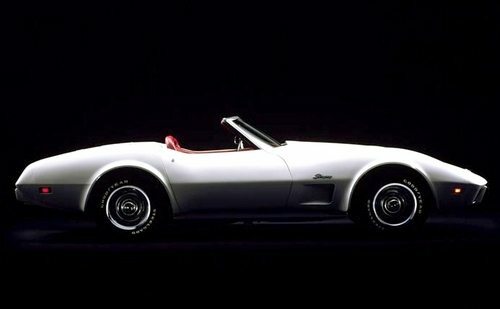 The 1975 Corvette was almost destined to fail before it was ever introduced. There were a number of contributing factors for this – the most significant of which was the retirement of Zora Arkus-Duntov, the “Father of the Corvette” on January 1, 1975. Zora had been instrumental in transforming the Corvette – almost from its inception – into a track-worthy sport car. 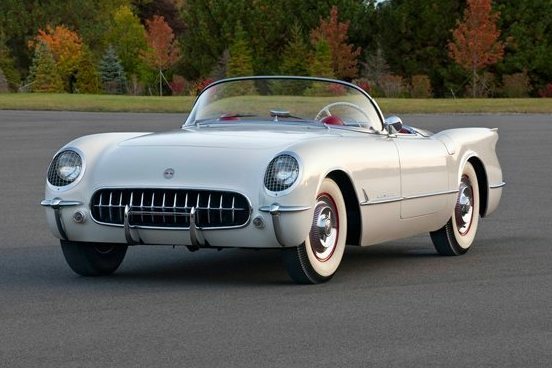 Had he not intervened in the very early years of the car, the Corvette would most certainly have “died on the vine” given the over-priced/under-powered nature of the 1953 and 1954 models. Instead, his involvement with the Corvette program catapulted the sports car into a machine that rivaled any similarly priced sports car in the world. His departure from Chevrolet left many questioning what would become of the Corvette. The second factor was the introduction of Federally mandated requirement to control exhaust emissions by introducing catalytic converters and the elimination of engines that could run on lead-based fuel. In 1974, it was possible to purchase a Corvette equipped with a big block engine capable of producing 270 horsepower, or even a small-block that was still capable of producing 195 horsepower. While arguably under-rated when compared to similar sized engines just a few years earlier, these numbers were still far more impressive than those produced in 1975. With the introduction of catalytic converters and the elimination of lead-based fuel (which caused a half-point drop in engine compression) , the 1975 Corvette was now only capable of producing a meager 165 horsepower. That’s correct – 165 horsepower. Admittedly, an optional L82 engine was offered that produced 205 horsepower, but only ten-percent of the Corvettes built in 1975 included the upgraded powerplant. For the rest, the 1975 Corvette was the most under-powered Corvette since its introduction in 1953 – and the 1975 Corvette was only capable of producing 15 horsepower more out of its small-block 350 engine than the 1953 “Stovebolt” six-cylinder engine. While the styling of the car remained virtually unchanged from the 1974 model year, this considerable reduction in horsepower ought to have negatively influenced consumers from purchasing the car. 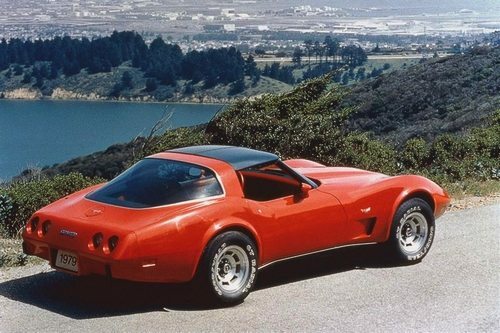 However, some speculation suggests that the 1975 Corvette sold as well as it did because of the uncertainty surrounding the Corvette’s longevity with the departure of Zora Duntov from the Corvette program. 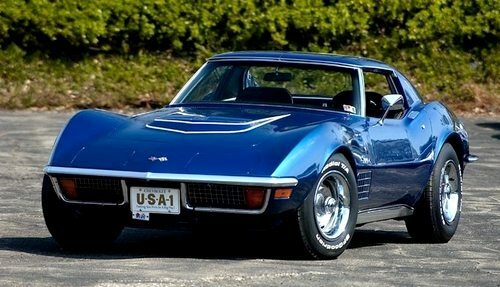 Despite a signficant loss in power compared to the 1974 Corvette (and, essentially, ALL Corvettes before it), Chevrolet managed to sell 38,665 of the 1975 vintage – which was the highest number of Corvettes sold up until that time. Selecting “the Best” Corvettes is arguably just as difficult as selecting the “the Worst”, and for much the same reasons. Every Corvette is unique unto itself, and many represent something more than just that piece of the “American Dream” that so many strive for. Some reflect the history of the people behind the car, others reflect the era in which its created. For 2004, the Commemorative Edition Corvette represented something that had long been missing from Corvette’s recent history – the car’s direct relationship between production sports car and a true race car. The Commemorative Edition 2004 Corvette was specifically designed to pay homage to Corvette’s successful return to racing. 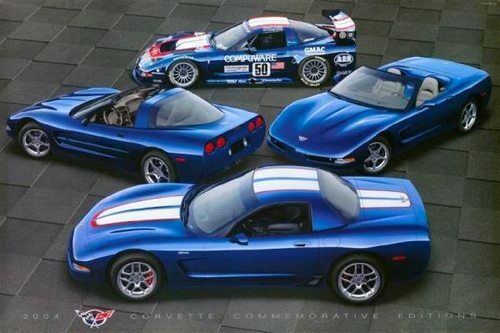 All the Commemorative Edition 2004 Corvettes were finished in a striking LeMans Blue paint with red-edged silver stripes that adorned the hood, roof and rear deck lid. Special “LeMans 24-hours” emblems featuring Corvette’s iconic crossed-flags trademark appeared on the nose and the tail of the car, and a matching emblem was embroidered into the headrests of the custom shale color interior leather seats. Completing the commemorative package on all of the specially equipped coupes and convertibles was the introduction of polished alloy wheels. This option, which could be ordered as part of the regular 1SB Preferred Equipment group, was also made available – at a moderate additional cost of $3,700 for either the coupe or convertible upgrade. The 2004 model would be the final year for the both the current production model Corvette in all its forms – coupe, convertible and Z06 editions – as well as its C5.R Corvette Race Car counterpart, and this particular Special Edition model was doubly fitting as it paid homage to the teams that helped return the Corvette to racing greatness. Afterall, as the C5.R neared retirement, its final season was nothing short of spectacular -and a fitting sendoff for a car that had proven, without question, that Corvette was a serious contender on the racetrack. 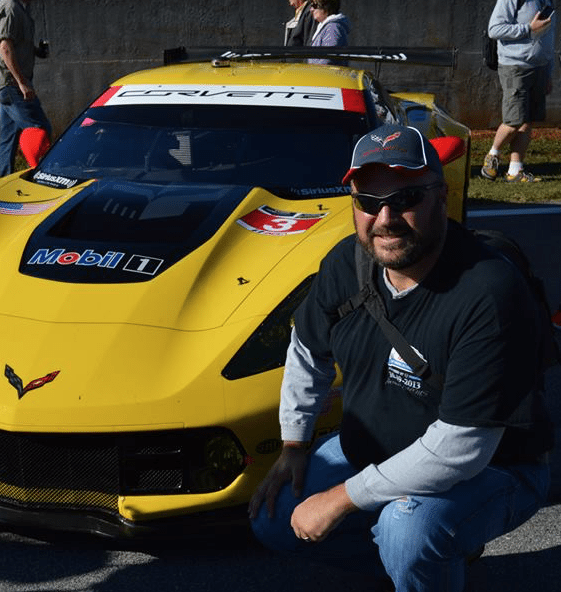 In 2004, Team Corvette went undefeated for the entire American LeMans Season. Every race run during this season was won either by the No. 3 or the No. 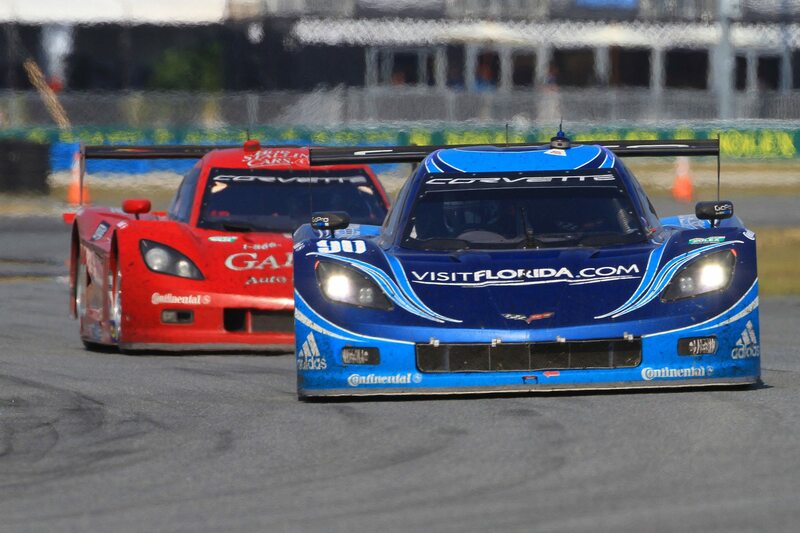 4 Corvette Racing Teams. Given that future generations of the production-model Corvettes would be engineered using data collected while racing around the globe, the Collector Edition also represented the first, early foreshadowing of the special relationship that would be shared by Corvettes both on and off the track. 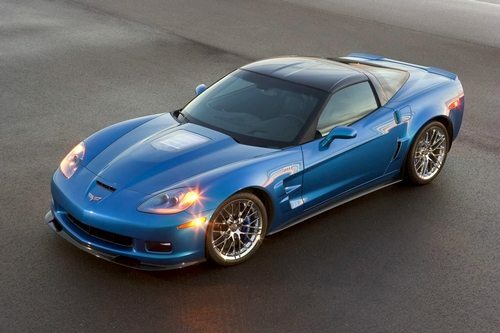 The designation ZR1 has always been synonymous with high-performance Corvettes. The first ZR1 appeared in 1970, twenty years before the more infamous “King of the Hill” ZR-1 had its great unveiling. In both instances, these special edition Corvettes produced significantly more power and performance than their base model counterparts. The 1972 model included a 370-hp LT1 engine and the 1990 model featured a 375 horsepower engine. In both instances, these cars were recognized for their incredible performance and set the performance standard by which all other Corvettes were measured. But despite its unprecedented performance ability, the 2009 ZR1 Corvette is also among the most civilized Corvettes yet built. It’s a car that can be driven as a regular commuter during the week, and then tear up the competition on the racetrack over the weekend. If a Corvette is best measured by its power and its drivability, then there is no argument that one of the greatest of all Corvettes is also one of the newest. Since its introduction in 2015, the C7 Z06 Corvette has been pushing the envelope of power and performance both on and off the race track. The car boasts 650 horsepower, 650 lb.-ft. or torque and a zero-to-60 time of just 2.95 seconds. Do we need to say anymore? Yes, lets…. The Z06 features a supercharged 6.2L V8 LT4 engine that utilizes direct injection and continuously variable valve timing to produce extreme speed and acceleration. The LT4’s supercharger displaces 1.7 liters and features a four-lobe rotor design that promotes efficient performance. An integrated intercooler further increases performance by cooling the air as it injected into the inner workings of this incredible powerhouse. For driving enthusiasts of all sorts, the C7 is the first Z06 to offer both an automatic and manual transmission option. The 8-speed automatic transmission offers full manual control to drivers (when so desired) via steering wheel paddles, while unique algorithms deliver shift performance that rivals the dual-clutch/semiautomatic transmissions found in supercars around the globe. Comparatively, the 7-speed manual clutch system features a lightweight dual-mass flywheel and high-capacity twin-plate 240 mm clutch, significantly reducing gear rattle and clutch inertia. In both instances, the Z06 Corvette also features a rear transaxle that improves weight distribution, keeping the car more evenly balanced during acceleration, turning and hard braking. Beyond all that, the car looks incredible. The concept of “form follows function” that was introduced with the 2014 C7 Corvette Stingray certainly continues to hold true here. For all of its track-ready capability, this car lacks nothing in the looks department. In fact, moreso than any Corvette that has come before it, this car rivals the lines and aesthetics of cars like Ferrari, Lamborghini and MacLaren. The high-end finishes on the interior, the well appointed cockpit, the powerful stereo and onboard technology all provide the occupants of the car with a driving experience that they are not soon to forget. Earlier in this article, we made mention of several C3‘s as being some of “the worst” Corvettes ever manufactured. It is fitting, therefore, that there is also a C3 Corvette that, in our humble opinion, carries the unique distinction of being one of the best. And I don’t think we’re the only ones that feel this way. The late-1960’s and early 1970’s were known as the era of the muscle car. However, as the muscle era was reaching its performance peak, and in a time when big-block engines with crazy amounts of cubic-inches defined the performance and level of horsepower being produced, Chevrolet decided to introduce a well-balanced, small block, 350-cubic-inch, LT-1 V-8 engine that was capable of producing 370 horsepower and turning heads everywhere it went. 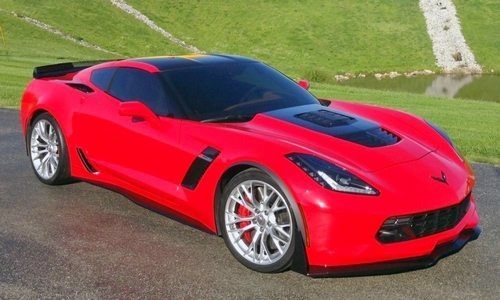 And while 370 horsepower was the “official” rating, most Corvette enthusiasts felt that this was a very conservative estimate of the car’s actual power. The LT-1 equipped Corvettes could manage a quarter mile run in just 14.2 seconds with a top speed of 102 miles per hour, strongly suggesting that the engine was probably producing closer to 400 horsepower. However, with stiffer emission regulations and the ever increasing cost of insurance, the lesser horsepower number remained the official published rating. Corvettes equipped with this engine received a special hood dome surrounded by striping and “LT-1” lettering. While these markings were certainly a differentiator between which engine a particular Corvette was built with, it was also readily obvious to anyone who heard the unique rumble from the exhaust pipes and the tapping of its mechanical lifters that they were in the presence of an LT-1 engine. The LT-1 engine came standard with a larger bore – two-and-a-half inch – exhaust system, and a larger carburetor – an 850 CFM Holley four-barrel with vacuum controlled secondary throttles. Although only a small-block, the Holley four-barrel was actually the same carburetor that GM had specified for Corvette’s big-block engine setups. In conjunction with the massive fuel delivery system, Corvette engineers also included a transistorized Delco ignition system, which helped produce reliable high-speed operation (with a redline of 6,500 rpm) in the LT-1 engine. The 1970 Corvette LT1 was specified for use in the SCCA’s Class B Production car series. For racers wishing to purchase a Corvette so equipped, they would need look no further than the factory order sheet and select the correct options, which included the LT-1 engine as well as a cold-air hood and all of the relevant brake and chassis racing equipment. While later iterations of the C3 generation would fall short of the mark set by this car, the 1970 LT1 Corvette remains one of the most sought after models of its day. Even with so many Corvettes to choose from, and even after researching and writing about some of the other Corvettes listed in this article, our selection for the number one “best” Corvette of all time was really pretty simple – and, for the Corvette enthusiasts reading this article – probably pretty obvious. 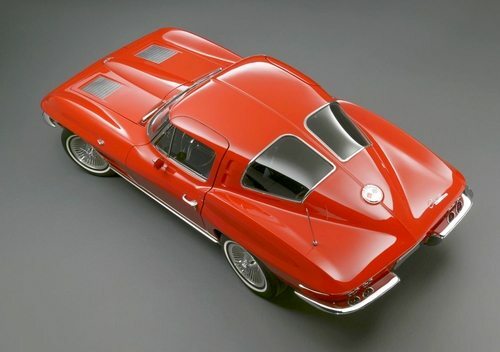 The 1963 Corvette, a fixed roof coupe, featured very aggressive lines, razor-sharp fender shapes, a tapered tail (similar to that introduced on the 1961 Corvette by Bill Mitchell), a sharklike front end with hidden headlights, and a split window back end that remains the most iconic element of any Corvette in the cars entire history. Aesthetics were not the only thing unique about the C2 Corvette. The car’s chassis was entirely new, with all-independent suspension incorporating transverse leaf springs that allowed Corvette to fare equally well as a comfortable daily driver, or as a fierce competitor on the race track. The car came equipped with a number of engine options, including the robust 360 horsepower, L84 small-block V8 engine. For drivers looking to getting the best performance out of the car, they need only select the Z06 option when ordering their car. 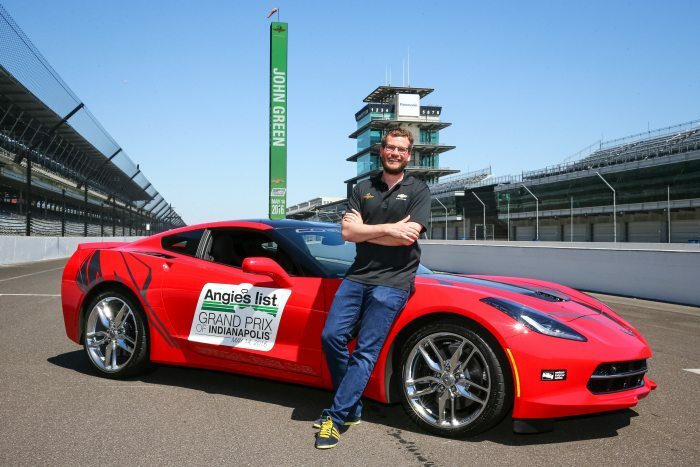 The Z06 option stiffened the suspension, tightened the ratios in the Muncie four-speed manual gearbox, beefed up the car’s stopping power with bigger drum brakes, and added a massive 36.5-gallon fuel tank to the car. To cap it off, the Z06 option also included a set of finned, cast aluminum, center knock-off, “turbine” style wheels. Chevrolet only produced 21,513 of these amazing Corvettes, and while many are now part of private collections across the country and around the world, it is still possible to find one for sale from time to time. The original 1963 Sting Ray Coupe is considered to be one of the most collectible Corvettes of all time because of its unique split rear window design. Surprisingly, many split-window coupes were modified by customizers, some of whom replaced the small, individual panes of glass with a one-piece window made of Plexiglass. Even more surprising is that Chevy began offering replacement one-piece windows through its dealerships. As a result, a good many 1963 Corvette coupes lost a considerable amount of their collector value. However, if you happen upon one for sale and can afford the pricetag that comes with it (and these days, their value has skyrocketed), you will be in the possession of one of the greatest pieces of Americana produced in the later half of the twentieth century. And for the rest of us, whose dream owning a 1963 Corvette might forever be out of reach, it is still an incredible experience to see one out on the road, at a carshow, or even parked in a museum. Great list… and detailed support, BUT where is the 67 435 horse 427? Gotta be top 5.